This post may contain affiliate links. Please visit my disclaimer page for more info. My hope with sharing this little recap with you is to help motivate + inspire you to know how much good can happen in one short year! I spent the beginning of the year planning + dreaming of the year ahead. I felt a big year coming ahead of me so I picked "achieve" as my word for the year. Achieve is defined as: to reach or attain a desired objective by effort, skill, or courage. "I will help spread positivity + hope to women + moms around the world. I will help them gain a positive mindset, take control of their lives, + motivate them to reach their full potential." We celebrated Izabell turning 3. "My sweet angel. Her birth was the moment that made us realize that we needed to change our path. Supporting a family of 4 after her birth made us see the need for a budget and some serious long-term goals. God made our Izzy Grace as a special gift to teach us this important lesson." We celebrated June turning 6. Daniel went on a tuna fishing trip. "My husband is the hardest working guy I know. This man spends half of the year away from home to provide for us. Although he used to be the spender of the two of us, he's spent the last 3 years doing without a lot of luxuries because he knew we had bigger goals in mind. We had debt free goals + retirement goals...goals way more important than fast food + new clothes. Another one of our goals was to have awesome experiences, and this weekend he got to go on an off-shore tuna fishing trip...paid for in cash! Living on a budget doesn't equal zero fun...it just equals discipline + only spending your money purposefully. Talk about a husband deserving nice things because he's a hard worker...this is the kind of stuff your husband "deserves"! Awesome adventures with his buddies with no guilty debt attached to it!" We hit one of our big goals + cash flowed a family boat! "This boat is what kept was motivated on the hardest days! This was a moment that we had been dreaming of our entire budgeting journey, and was our first real treat since we had started! ...I don't think at the time that we really thought all of those things would happen. I think we hoped they would happen...but did we understand that this life was really possible? ...not completely. Everyone says write out a goals list, so we did! We did the math and projected that we'd be able to buy a boat (in cash) by Spring 2017. Guess what guys!?! It's Spring 2017...and we're the proud owners of a 26-year-old, paid for in cash, $6,800 boat!" We sold our rent house + paid off another $98k in debt! I wrote an epic guest blog for my sweet friend, Allie Casazza, that doubled my audience in just a few days. "We were drowning. I thought we must be the only family who was struggling to keep up. The overwhelming stress had become normal. Paydays came and went, but there was never anything to show for it. Our seemingly perfect life was crumbling all around us. Our lives were flying by so fast that it felt like we were stuck on a never ending treadmill. There was never enough money to get ahead." Read the whole article here! June had her 3rd Dance Recital. We traveled to Austin + met Jen Sincero. We sold our old camper + threw another $750 into savings! We spent a lot of time camping + boating over the Summer. "One of our biggest whys for living on a budget + becoming debt free is traveling! We're spending this week on the beach in Galveston. So many happy memories being made. My heart is so full." I finally got brave enough to cut all of my hair off! We moved into our new house! “This was one of the hardest decisions we’ve had to make in our marriage to date. However, after reading Lara Casey’s Make it Happen, we decided to take the plunge. She says in the book, “You know all of those things you’ve always wanted to do? You should go do them.” God spoke to me in that moment and said, “Do it! It’s time!”. He needed us to take a leap of faith. He needed us to be scared. He needed us on our knees at his feet. ...and that’s where we sat for about 7 months. We decided to move into a MUCH smaller 2 bedroom, 1 bath rent house before our 5 bedroom, 2.5 bath house had actually sold. We decided to basically stop saving money and pay for both our mortgage and this rent house until further notice…for the sake of our sanity. I became obsessed with the Power Sheets by Cultivate What Matters. "This awesome goal planner helped me really get serious about my goals for the second half of 2017! I was able to set, plan, and track my goals...and make a lot of progress on some big goals!" Shop for your own set here! We celebrated A Sunny Side Up Life turning one year old + did a super fun photo shoot with one my best friends Morgan Marshall. “On my birthday, August 2oth, I’m also celebrating the 1 year anniversary of A Sunny Side Up Life. I still can’t believe a blog that start basically out of summertime boredom has turned into a movement! Now, I’ve grown this life changing movement to thousands of women from all over the world. Families are paying off debt + starting to enjoy financial freedom! The girls started a new year of Dance Class. Now here we are 4 years later with brand new leotards, hand-me-down ballet shoes, and kids that honestly have no idea how hard their parents have worked for them to get to enjoy this beautiful luxury." I launched my course, Your Sunny Money Method. "I've spent the last 3 years getting my own family out of a massive amount of debt! Now, I spend my days helping overwhelmed women from all over the world with their families' budgets! ...and I want to help your family next! My course is a simple approach to your family's budget. I've designed it specifically for overwhelmed women who are ready to break free from financial survival mode! I've honestly put my whole heart into this project....and I just can't wait to get this course into the hands of my sweet ladies!" Learn more about my Budgeting Course here! Daniel + I celebrated our 9th anniversary. "Shout out to my amazing husband + best friend. Staying gone half the year, missing holidays, and living on a boat isn't easy and sometimes isn't fun...but he continues to show up for his family. The positives out-weigh the negatives, and we continue to focus on what we're gaining instead of what we're giving up. Thank you for all that you do for me + our girls! I love you a million times!" "Melanie's birth symbolizes so much for our family. Not only did our family become complete with her birth, but with her surprise pregnancy (3 months into our budgeting journey) our family had a huge motivator to get our money right. I found out I pregnant with her only a few weeks after finally getting brave enough to add up our $490k worth of debt. I sat in tears wondering how we'd ever become debt-free....and then only weeks later to find out I was pregnant with a 3rd little one. I was honestly divested and almost angry that I was pregnant. I thought that we'd never be able to get ourselves out of all that debt now for sure! SEVERAL small debts were gone, all of her medical bills were either paid or saved up for, and we even saved enough for her Daddy to take a week off of work! She's my message from God that sometimes all you need is a little extra motivation, a huge heart for your family, and lots of prayers! His timing is always correct....there's no telling where we'd be without our sweet Melly as motivation." We finally received an offer on our house. “This house is our last debt item. Our contract is still pending at the time of writing this, but we're hoping to close very soon, and become 100% debt free at the beginning of 2018! Read more about why we're selling our house to become debt free here! Ready to get started on your own jounrey to financial freedom? Wow what a year! 2017 was definitely the year of “achievement”! Some goals were accomplished + some weren’t. Lots of grace, lots of motivation lost + found again, lots of setbacks with our savings after we decided to move, lots of tears + prayers, lots of waiting, but lots of joy, lots of laughs, and lots of growth. This journey isn’t always easy, but it’s not supposed to be! We’re changing our lives here. Breaking old habits, repairing old mindsets, and transitioning into a life that most people only dream of. 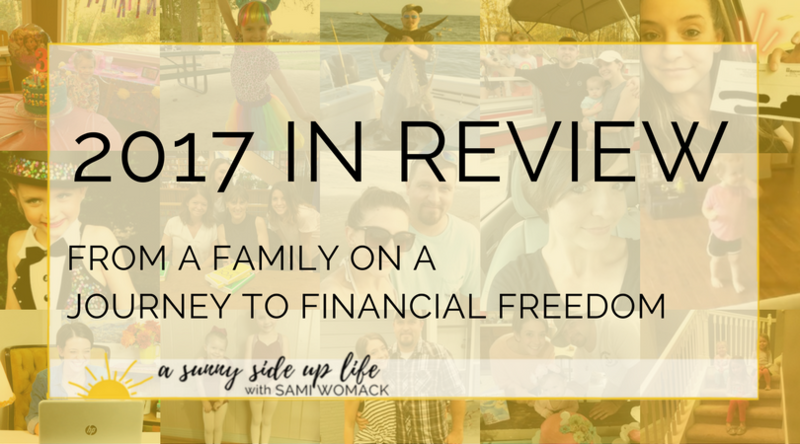 Becoming debt free in 2018 is just the beginning of this epic journey that our family is on! ...and if our family can do it, so can yours! Happy New Year friends! Pin this article to your favorite Pinterest board!